Ask Me Another host Ophira Eisenberg chats with Rose Byrne at the Bell House in Brooklyn, New York. Rose Byrne appears on Ask Me Another at the Bell House in Brooklyn, New York. Rose Byrne has her older sister to thank for launching her acting career. When Byrne was eight years old, her sister told their parents that Rose ought to study acting. 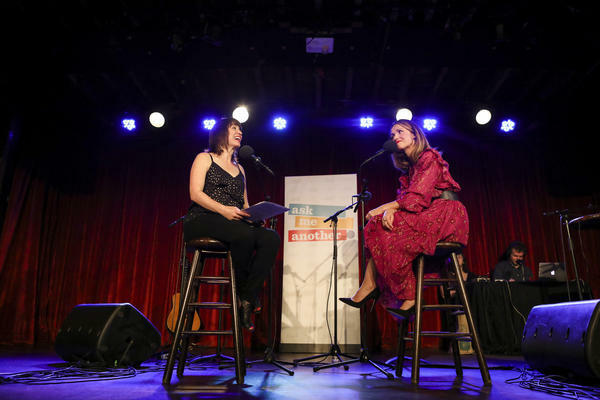 "I was very shy," she told NPR's Ask Me Another host Ophira Eisenberg at the Bell House in Brooklyn, New York. "I think they thought it would help me come out of my shell, perhaps." Byrne, who grew up in Balmain, a suburb of Sydney, joined the Australian Theatre for Young People and discovered her love of acting. Byrne's first role was in the 1994 Sandra Bernhard film Dallas Doll. But her life changed, at age 15, after being cast as the lead role in a short-lived Australian soap opera Echo Point. When the series was cancelled just three months after it first aired, her life returned to normal, "I was back at high school, like, what happened to hair and makeup?" Byrne co-starred with Heath Ledger in the 1999 Australian indie film Two Hands, which was met with international acclaim. In the early 2000's Byrne moved to Hollywood and scooped up roles in Star Wars: Episode II – Attack of the Clones and Troy. She later made her American television debut opposite Glenn Close in FX's legal drama Damages. Byrne cites her part as Duchess de Polignac in Sofia Coppola's Marie Antoinette as leading her to take on more comedic roles. "She was very bubbly... the comic relief. That was kind of the first taste, I was like, this is fun and interesting!" She further cemented her turn toward comedy in 2011, playing Kristen Wiig's nemesis in Bridesmaids. Byrne later teamed up with her Bridesmaids co-star Melissa McCarthy again in 2015's Spy, portraying the foul-mouthed villain, Rayna Boyanov. Byrne told Eisenberg, it wasn't a stretch to perform the character's obscene lines: "Well, I am Australian!" In 2009, Byrne read Nick Hornby's novel, Juliet, Naked and loved the tone of his writing and the development of the characters. So when she learned the book was being adapted to film, she chased after the role of Annie. "I thought she was intriguing," she recalled. "I loved her breaking all the rules and taking all these risks and acting out. She is this sort of uptight, buttoned-up very British lady who then goes against all her rules, you know?" Byrne's 2014 film Neighbors was released in Australia under the title Bad Neighbours. She played an Ask Me Another game identifying the titles of other Australian releases of American movies. "It's very remote, beautiful part of the world, probably a good place to go when the end comes." "I did some fine work in Australia which no one will ever see." JONATHAN COULTON: This is ASK ME ANOTHER, NPR's hour of puzzles, word games and trivia. I'm Jonathan Colton. Now here's your host, Ophira Eisenberg. Thank you, Jonathan. It's time to welcome our special guest. You know her from the TV series "Damages," many movies, including "Bridesmaids," and she stars in the new film "Juliet, Naked." Please welcome Rose Byrne. EISENBERG: Welcome to ASK ME ANOTHER. EISENBERG: You're originally from Sydney, Australia. BYRNE: I am from Sydney. EISENBERG: Now you live in Brooklyn. EISENBERG: That's very exciting. Your parents have retired to a garlic farm in Tasmania. EISENBERG: ...Would they be like, oh, I get it. BYRNE: (Laughter) It's not, like, a quintessentially, like, Australian move. BYRNE: No, it's very remote - very remote, beautiful part of the world, probably a good place to go when the end comes. EISENBERG: OK. So when you were a little kid, it was your older sister who said to your parents when you were 8 years old that you should study acting. BYRNE: Yeah. I was very shy. BYRNE: ...In Brooklyn (laughter) with you onstage. So I could have gone either way, you know? But I loved it. Yeah, I was - became my thing, yeah. EISENBERG: You got into it. BYRNE: I got into it. EISENBERG: And you got roles as a teenager, a pre-teen. BYRNE: I did. I did some fine work in Australia which no one will ever see. EISENBERG: But you did the Sandra Bernhard movie called "Dallas Doll." BYRNE: ...Another fine film, yes. EISENBERG: But at 15, you're also cast as a lead in a soap opera called "Echo Point." BYRNE: Phenomenal show. Beli, my character was called. BYRNE: Yeah. Going down the tuck shop. BYRNE: A lot of that kind of talk. Going to surf club. BYRNE: ...Going to surf club. EISENBERG: So at 15 years old, if you're the lead of a soap opera, your life must have totally changed. BYRNE: It did. I took myself very seriously. BYRNE: ...Came crashing down very fast. And I was back at high school. EISENBERG: Back at high school. EISENBERG: I didn't - I have to finish high school? BYRNE: Exactly. I have to go back to school? EISENBERG: So you moved to America in 2000's - early 2000's. BYRNE: ...Of like - yeah, coming in for a few months, trying to get a job, going back to Australia, staying with mom and dad (laughter). EISENBERG: So we know you from a lot of dramas, but then of - you know, more recently, we know you from so many comedies. Was there a particular role or moment that you had that you were like, I want to lean into the comedic side of my acting career? BYRNE: ...This super funny satire on, you know, rock stars and what have you. And I played a super trashy, wasted popstar who was Russell Brand's ex-girlfriend. It was very fun. And from that I got "Bridesmaids." And yeah, so I had a great break from Judd Apatow and Nick Stoller. EISENBERG: I just loved "Bridesmaids." EISENBERG: ...I feel like makes it as the nemesis. EISENBERG: ...Audience point of view. BYRNE: Yeah, in "Spy," yeah. EISENBERG: ...In "Spy," which is hilarious as well. BYRNE: Yeah, that was so funny. EISENBERG: I mean - oh, is that the natural you? Is that who you are? EISENBERG: Right. Oh, that's right. EISENBERG: So it is within your soul. EISENBERG: So your new film - this is an adaptation of Nick Hornby novel, "Juliet, Naked." And you aggressively went after this role. BYRNE: I did. I did. BYRNE: ...You know, regretfulness. And it's such a gift, the characters he gives you as an actor - so to then put them into a screenplay and try to bring it to life. So yeah, when I heard they were doing the movie, I was like, please, can I meet on it? Can I read? EISENBERG: You had read the book before. BYRNE: Yeah, I had read the book before. EISENBERG: And what did you think of your character? BYRNE: I thought she was intriguing. I thought that I loved her breaking all the rules and taking all these risks and acting out. And she's - is this kind of uptight, buttoned-up, very British lady who then goes against all her rules, you know? Did you ever watch Seinfeld? BYRNE: Well, do you remember when George does the opposite of everything he usually does? EISENBERG: And everything works out. BYRNE: ...Great success and he starts working for the Yankees and, like, gets a hot girlfriend. That's kind of like Annie. Like, she's, like - starts doing all the opposite of all the stuff. She doesn't have as great a success as George Costanza. BYRNE: But it's sort of that kind of idea. EISENBERG: ...But you also - congratulations. EISENBERG: So you also had, like, some bizarre blender accident with your hand. BYRNE: Put my finger in a blender. EISENBERG: Why did you - how? EISENBERG: How did - what happened that you put your hand in a blender? BYRNE: What a shame that was. EISENBERG: Yeah. You still have the hand. The hand's OK, right? BYRNE: This is a great idea. I'll make muffins, and we can eat them in the morning - and then at the emergency room, just holding my finger together like that, just, like, sad. EISENBERG: And then someone walks by, and they're like, I loved you in "Star Wars." BYRNE: Sup. That's right, Dorme, hey. EISENBERG: All right, Rose, are you ready for an ASK ME ANOTHER challenge? EISENBERG: Yeah, you're up for it. EISENBERG: All right. Rose, you starred in the movie "Neighbors." In Australia, "Neighbors" was released under a different title "Bad Neighbours" to avoid confusion with a long-running Australian soap opera called "Neighbours." So in this quiz, I'm going to give you the American title of a movie that was changed when it was released in Australia. EISENBERG: OK, you're just going to tell me what the title was changed to in Australia. EISENBERG: It is multiple choice, though. EISENBERG: And if you do well enough, Tara Woolfolk (ph) from Hockessin, Del., is going to win an ASK ME ANOTHER Rubik's Cube. EISENBERG: ...Or C, "Suddenly 30"? BYRNE: I'm so glad it wasn't the other two. They're terrible. EISENBERG: I kind of want to run something called Womanhood Now. EISENBERG: I don't know what - some sort of campaign. EISENBERG: I - we don't know why "13 Going On 30" had to be changed. BYRNE: Yeah, I don't get that either. It's pretty straightforward. EISENBERG: Yeah - "Suddenly 30." EISENBERG: "Suddenly 30." Was the classic 1980 Leslie Nielsen spoof "Airplane" called A, "Airplane Mode," B, "Flying High" or C, "Mile High Police Squad"? EISENBERG: "Flying High," yeah, that's right. EISENBERG: What was the Australian title for "Fever Pitch," the 2005 romantic comedy starring Drew Barrymore, Jimmy Fallon and the Boston Red Sox? These are, like, hard to actually bring over. Was it A, "The Perfect Catch," B, "Smooching In The Outfield" or, C, "Third Base"? BYRNE: Oh, I think it's the first one. EISENBERG: Yeah, it's "The Perfect Catch," yeah. BYRNE: Yeah, yeah, yeah, yeah. EISENBERG: All right, here's your last clue. EISENBERG: ...Or, C, "Evil Woman"? EISENBERG: And one of them is real. BYRNE: I mean, it can't be "Saving Silverperson," can it? EISENBERG: No, but I love that idea. BYRNE: It's got to be "Evil Woman," right? EISENBERG: And from what we can gather, it was just a way - it wasn't doing well at the American box office, so it was just a way to, like, dial it up so people were like, "Evil Woman" - let's go see that. BYRNE: Wow. It was a comedy, you said. EISENBERG: Yeah, it was a comedy. EISENBERG: Yeah, you did great. EISENBERG: So congratulations, Rose. You and Tara Woolfolk both won ASK ME ANOTHER Rubik's Cubes. EISENBERG: "Juliet, Naked" is in theaters now. Give it up one more time for Rose Byrne. (CHEERING, APPLAUSE) Transcript provided by NPR, Copyright NPR.